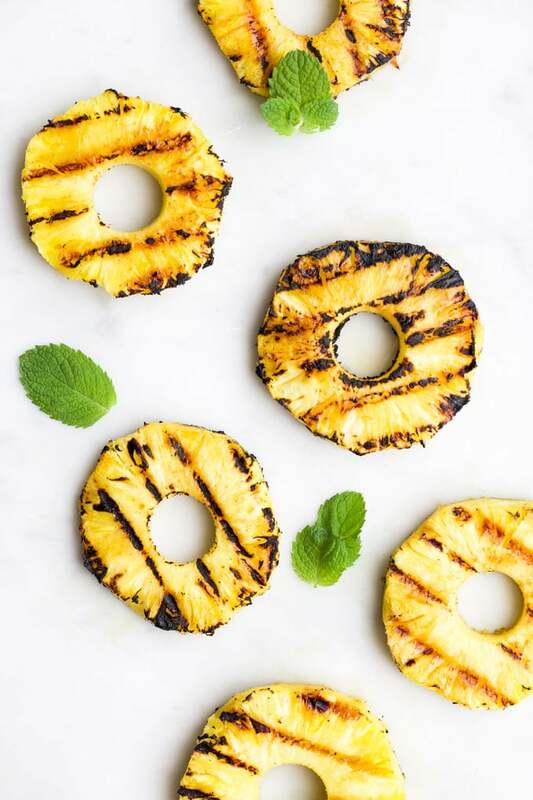 If you haven’t tried Grilled Pineapple before, you are seriously missing out. The heating process caramelises the pineapple, taking this already sweet, tropical fruit to the next level of deliciousness. 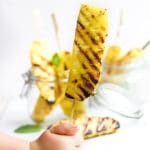 There are many recipes for grilled pineapple on the internet and most involve coating the pineapple with brown sugar or a honey-based marinade. Not this recipe (if you can call it a recipe! ), I’ve kept it simple, letting the natural sweetness of the pineapple shine through. The trick is choosing a good pineapple. 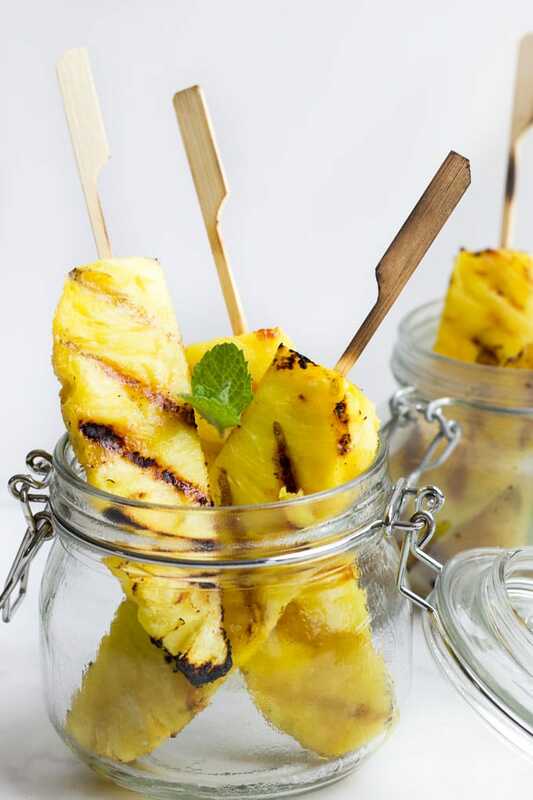 If your pineapple is perfectly ripe then your grilled pineapple will taste amazing just as it is. There are several ways to tell when a pineapple is ready. Smell – A ripe pineapple will have that distinctive sweet pineapple smell. A sour/fermented smell is an indication it has gone past its best. Touch – A pineapple should give slightly when squeezed. Rock hard pineapples are not ready to eat. However, if the skin is soft and spongy, it’s a sign that the pineapple has begun to deteriorate. Pineapple is easiest to grill when it is cut into spears or rings that are around 1-1.5 cm (1/2 inch) thick. This allows a good surface for grilling and is easy to handle. Lay the pineapple horizontally on a chopping board. Secure the pineapple with one hand and, using a sharp knife, slice off the top and bottom of the fruit. Stand the pineapple upright and carefully trim the skin, starting from the top, following the natural curve of the fruit, to the bottom. Be careful to reserve as much as the flesh as possible. Holding the pineapple firmly, slice it in half (vertically), then in half again to create four sections. Slice off the majority of the hard and fibrous core from each section (holding the section vertically and cutting downward). Leaving a small amount of the core makes the pieces more stable (easier to handle on BBQ and easier to skewer). Finish by slicing each section in half again to give you 8 pieces. Some pieces may be too thick and may need to be sliced again. You should end up with 8 pieces for a small pineapple, or 10-12 pieces for a larger pineapple. Lay the pineapple, horizontally, on a chopping board. Holding it firmly, cut slices approx 1-1.5 cm (1/2 inch) thick. Use a round cookie cutter, or pairing knife to remove the core. If you prefer, you can leave the core in the pineapple and just eat around it. 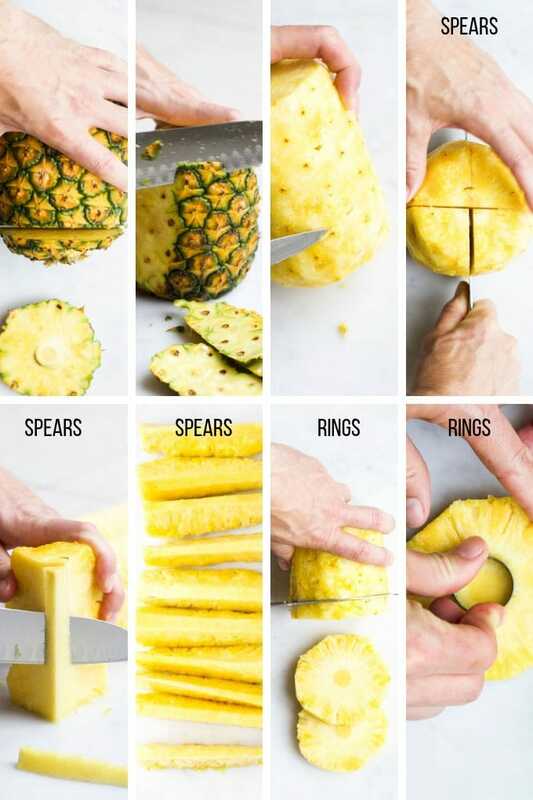 You could also cut the pineapple into semi-circles, leaving the core intact to use as a “handle” to eat around. Grilling pineapple is easy. You just lightly oil your barbeque grill and cook the pineapple for 3-4 minutes on each side, or until the pineapple turns golden brown with grill marks. If you prefer to stay indoors then you can also cook the pineapple on a cast iron grill pan. Lightly oil the pan and cook for around the same length of time. Grilled pineapple is delicious served as it is, or along with a dip, but it can also be added to a range of dishes. Have you tried this recipe? Did your kids love these “Pineapple Pops”? I love to hear your feedback. Please rate and leave a comment below or tag me on Instagram. Preheat your barbecue grill to high heat. Lightly oil the grill rack. 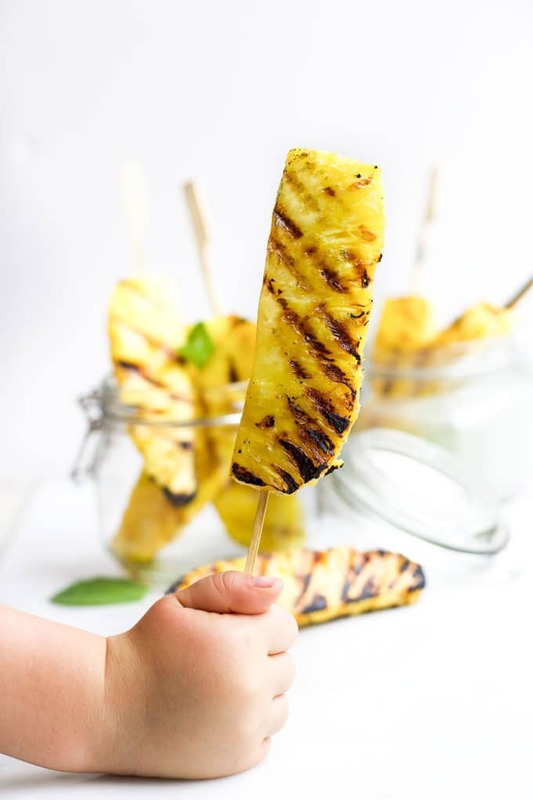 Place pineapple spears/slices onto the grill and cook for approx 3-4 mins each side, or until the pineapple becomes golden brown with grill marks. NOTE: If using wooden sticks you will need to soak the sticks in water for at least 30 mins prior to grilling ( I generally soak overnight). Skewer each pineapple spear with a stick before grilling. Please see post above for information on how to cut pineapple into spears or rings.